It was overwhelming to see your response on the blog on Linear Regression. After seeing such a great response, I decided to write on Hypothesis testing, another very important topic for CFA/FRM quant exams. I am following the same style of presenting the topic in a simplified yet in a brief manner focusing on what is important for CFA/FRM exams. Hypothesis Testing might sound complicated the first time we read it but actually it’s a simple tool designed to statistically validate our hypothesis. Hypothesis Testing makes our job easier by giving us the power to conclude by having information about only a sample of the total population rather than going through the entire population. The other important thing to note while Hypothesis formulation is whether our hypothesis test is one tailed or two tailed. If we are using < = or >= sign in our Hypothesis testing then we are using a one tailed test and if we are not using them then our test is a two tailed test. In a two tail test, we have to consider both side of our distribution. In case of unknown variance, t-test should be used .If the variance is known and the underlying distribution is normal distribution, z-test should be used. But if the underlying distribution is not normal and the variance is known then for large sample size, z test can be used. The third step in the process is to determine the Test statistic based on the test we choose. The test statistics for T and Z test are given as follows. Our critical value is called so because it is the value that will be compared with the test statistics and will be used to conclude whether our null Hypothesis can be rejected or not. Critical Value will depend upon level of significance (Î±) and the choice of test. Critical value can be found by looking up in the table corresponding to the test chosen. For a two tail test the value to be looked up is Î±/2 whereas for a one tail test it is Î±. 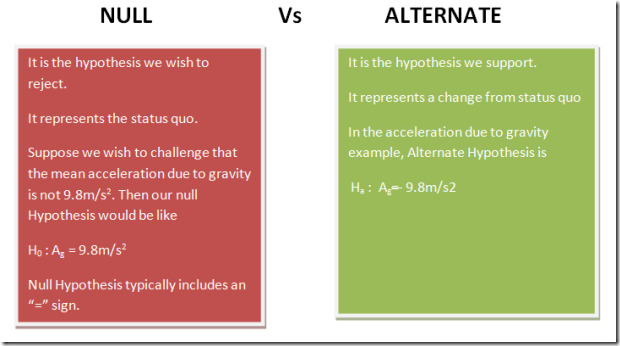 If Null Hypothesis gets rejected that means we are able to support our Alternative Hypothesis. Power of a test lies in the ability to correctly reject the null Hypothesis when it is false. P-value gives the probability of obtaining a test statistic that would lead to rejection of the null hypothesis, assuming the null hypothesis to be true. Suppose we have a two tailed test with the test statistic equal to 2.1. P-value gives the smallest level of significance for which the null Hypothesis can be rejected. So, in the above example if we take the significance level lower than 3.58 %, then we can’t reject the null hypothesis. Incase of any questions or queries, mention them in the comment box below. Whichc Financial Calculator should you use?